Baseball in D.C.? George Steinbrenner Approved. There’s no doubt that the Yankees late owner George Steinbrenner, 80, who died early Tuesday morning after suffering from a heart attack last night in his Tampa, Fl. home will go down in baseball history as a ruthless, hard-nosed owner dedicated to one sole cause — winning. He will be remembered in New York for numerous reasons whether it’s his treatment of Yankees Hall of Famer Yogi Berra in 1985 after revoking his role as team manager for going 6-10 to open the season or the 11 pennants and 7 World Championships he brought to a franchise who was struggling to stay afloat when he purchased the Yanks from CBS in 1973. But what did this man so concerned with winning have to do with baseball in D.C.? The D.C. Sports Bog dug up a few choice quotes from Steinbrenner’s past. It turns out the man was not only supportive of baseball in D.C. but he was willing to “test the waters” by bringing his boys down to the capital to see what kind of response they got for playing against a newly appointed D.C. squad. “I’ve been for having a franchise in Washington since I’ve been in baseball. I told (AL President) Lee MacPhail I’d be ready to bring the Yankees down there for some games – to test the waters if some people weren’t sure how it would go,” Steinbrenner told The Washington Post in 1978. This was when the Senators had been gone for seven years, leaving Washington barren baseball-wise and starving for something to fill the void. It wasn’t until year’s later that Steinbrenner’s point about what appeared to be holding folks back from jump-starting a baseball franchise in the District became an enacted reality. The Lerner’s have since taken the cause upon themselves and brought baseball back to the District in form of the Washington Nationals. 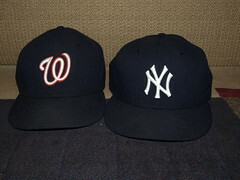 Albeit the Senators were an American League team which might have been part of Steinbrenner’s willingness to participate in teaming up to face a Washington ballclub to “test those waters”, but this National League squad did see their fair share of Steinbrenner’s Yanks since their inaugural season in 2005. Either way, it’s nice to know even the darkest of dark baseball lord’s was pro-District baseball. The Lerners didn’t bring baseball back, they bought the Nats after MLB moved the Expos here and ran them for 1.5 seasons.